WeetBix is often mixed with milk and at times become boring to consume. Hence I started making variations with them. Weet-bix upma is one such variation which can be consumed by both diabetic & non-diabetic people. This recipe is completely healthy and after consuming, you would feel very light. I have used very less oil (2tsp) in my video and you can just restricting to only 2 tsps. I was holding back this recipe for a long time as I wanted add methi to it and shoot the recipe. 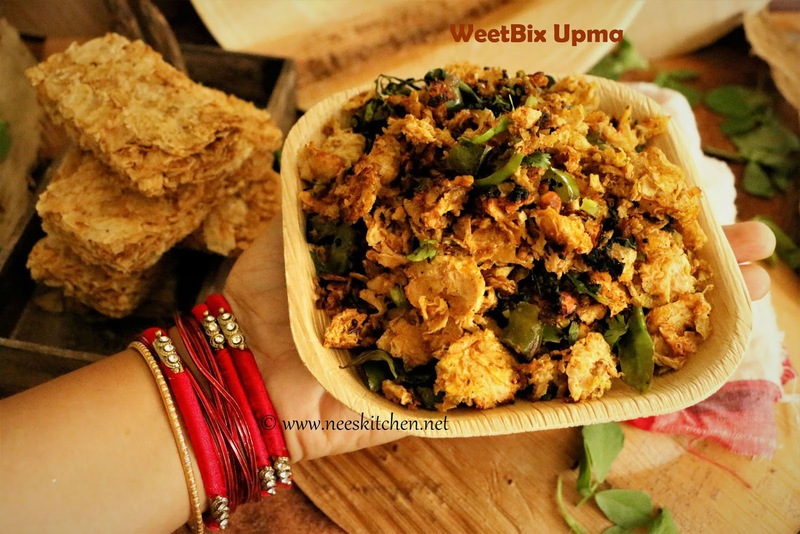 Methi is actually optional and you may mix and match any vegetable which is suitable for upma. You can make it kid’s friendly by adding potatoes. Since this is generally a breakfast recipe at my home, I have added only 1 chili as we do not prefer to eat spicy in the morning. We started using the palm leaves plate in the mornings as it is easy to use and throw during morning rush hours. They are healthier option than the plastics. Details of the cutlery are given below in my post. 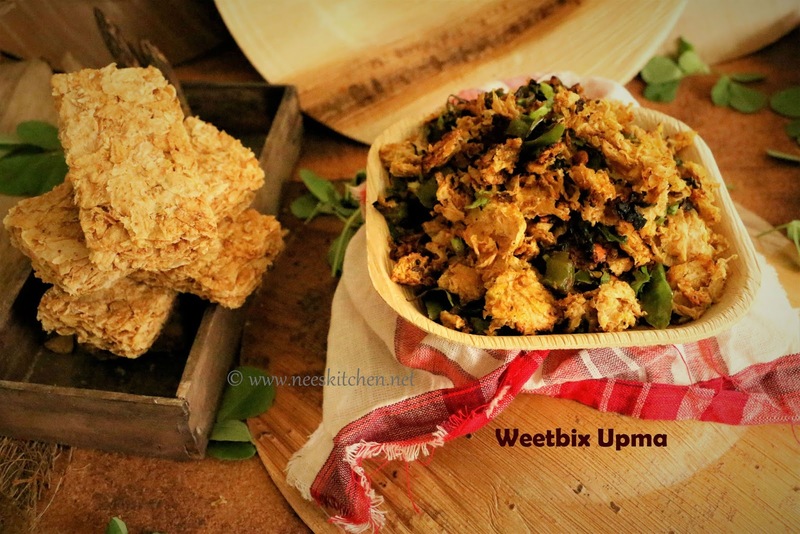 WeetBix is available in India,Singapore & US (and many more countries) in almost all departmental store. Though there might be a slight name change like “Wheata bix” , “Weeta bix” etc. 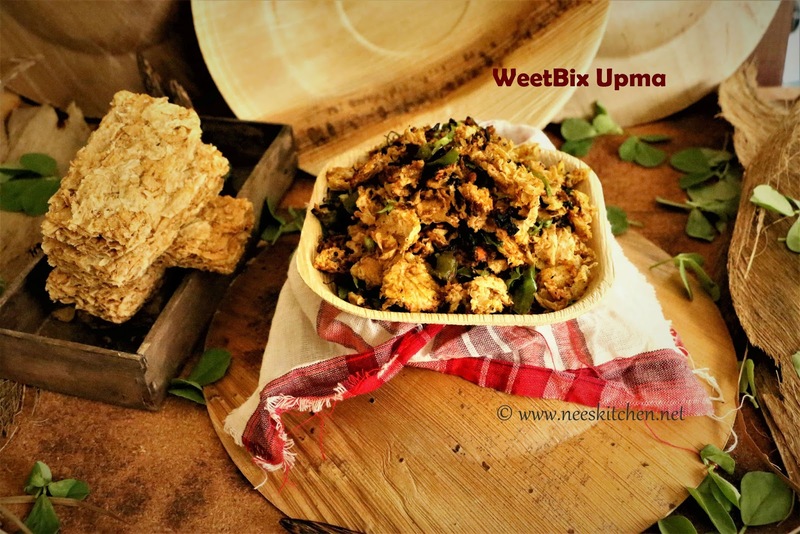 A sample cover is attached as a part of my video.This recipe is very quick to make as the main ingredient “Weet Bix” is readily available and can be cooked in few minutes. PS: This is not an advertisement of weet-bix. 1. Take a pan and add oil. 2. Once the oil is hot, add hing powder. 3. Once the hing is fried, add mustard and allow it to splutter. 4. Add Channa dhal and cumin seeds. Fry them. 5. Add green chili and fry them well. 6. Add onion and fry for 2 minutes. 7. Add capsicum and fry until both onion and capsicum are cooked. 8. Add methi leaves and mix them well. The methi leaves will get cooked faster, hence put them only after onion-capsicum is cooked. 9. 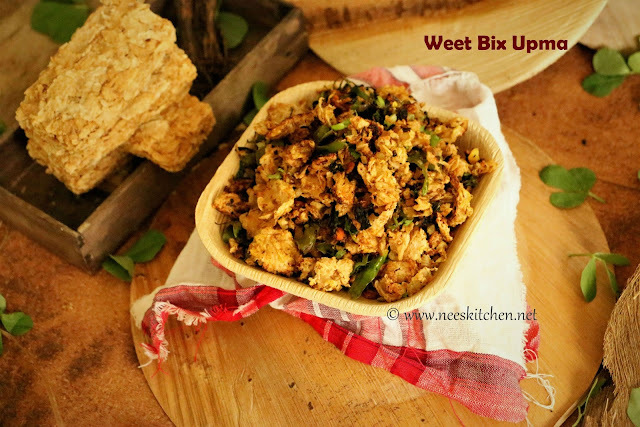 Crush the weet bix and add it to the pan. 10. Mix well, sprinkle little water and close it with a lid. Open at regular intervals to mix. 11. The upma is ready once the crunchiness of the weetbix is gone. Make sure to cook in low flame.